Sung Vespers 6pm every Sunday at St Wilfrid's Church in York. There will be a Sung Midnight Mass at St Wilfrid's Church in York. It will be preceded by carols and readings, starting at 11.15pm. There was a very beautiful Mass yesterday evening in St Wilfrid's Church, York for the feast of the Immaculate Conception. 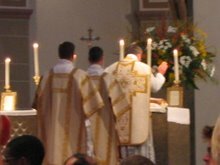 It was interesting to note that there were several people there that I do not remember seeing before at a Latin Mass at York. 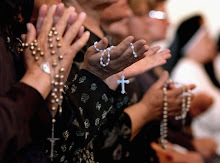 One must presume that their presence was motivated by devotion to the Immaculate Conception. Whatever their reason for being there, it is gratifying to see new faces. The choir was in good form, despite the absence of organ accompaniment, singing Missa de Angelis, and an excellent sermon was preached by Fr Mark Drew. After Mass there was some discussion about the statue of Our Lady which had been placed on the sanctuary for the novena. It was unusual in that Our Lady had no veil, and a few people noticed this, adding that the absence detracted from the appeal of the statue, despite it being very fine in other respects. The first question raised was to ask whether there was any reason for this ommission; and one possible explanation offered that it might be a represent of Our Lady Queen of Heaven, which would not require a veil. However, this seems an unlikely explanation because Our Lady Queen of Heaven would surely have a crown. Another suggestion was that there may originally have been a crown belonging to this statue which has been lost; or indeed, there may have been a fabric veil at one time. I have looked at hundreds of images of Our Lady on the internet, and only a tiny proportion do not have a veil. Most of these are modernistic images and rather quirky. In most cases where Our Lady is crowned, she is also wearing a veil. So the statue at St Wilfrid's is certainly unusual. Does anyone have a better explanation? It was generally agreed that this statue would be improved by the addition of a veil. Traditional Vespers, followed by Benediction, are now sung every Sunday evening at 6pm at St Wilfrid's Church in York. The first occasion was last Sunday and it went pretty well, despite not many members of the choir being familiar Vespers. Vespers consists of five psalms sung to an appropriate psalm tone, each being preceded and concluded by by an antiphon. It is the antiphons that can be a little tricky for the new comer, as each has its own tune. There is also a short reading, or chapter, and the service concludes with the Magnificat. Anyone unfamiliar with Vespers may find themselves at sea on the first occasion, but after attending a few times, it will all fall into place. Many people then find themselves hooked on on the music of Vespers. There is also the reward of Benediction afterwards. There will be a Latin Mass at 6pm on Monday 8th December at the Church of St Wilfrid in York to celebrate the Feast of the Immaculate Conception. Today I read that a second Juventutem group has been formed in the Diocese of Hexham and Newcastle. The first was formed several weeks ago and is based in Gateahead, with Fr Michael Brown as chaplain. The newly formed one is based at St Cuthbert's Church in Durham, where the University Catholic Chaplaincy is based. Fr Bede Rowe is the chaplain to the new group. They are to have a Mass to celebrate the feast of the Immaculate Conception at 7pm on 8th December. It is to be a Missa Cantata with a student choir providing the music. As far as I Know, these two groups are the only ones in the North of England. So there are plenty of opportunities for young people to form Juventutem groups in the northern cities. How about York, Hull or Middlesbrough! Yesterday, which was the first Sunday of Advent saw Vespers introduced at St Wilfrid's Church in York. It was at 6pm, and was followed by Benediction. There was some nervousness amongst the servers and the choir, as for many it was a new experience. However, it all went well on the night. Including clergy, servers, choristers and general congregation, there were about thirty present, which was pleasing, as we had no idea how popular it would be. From now on, there will be Vespers and Benediction every Sunday evening at 6pm.